The business at via Felice Cavallotti, 14 in Vittorio Veneto was founded by Teodoro Carnielli in 1931 and produced many different motorcycles powered by JAP 175 and 200 cc engines, 500cc and 250 Rudge Python powerplants, and others with Kuchen 350 and 500cc engines. Between 1952 and 1953 they built 50cc mopeds and light motorcycles with 75, 98 and 125cc twostroke engines, and also a 98cc NSU-powered motofurgone. They also used NSU engines in Vittoria 125cc motorcycles and scooters. In the 1920s Carnielli built Bottecchia bicycles, named for a cyclist who won the Tour de France twice. Postwar, they fitted fitted Vittoria mopeds with 48 cc Lambretta engines (1957) and also built a sports machine with an NSU engine. 1968 saw the appearance of the famous Motograziella, a foldable minibike with a Sachs 50cc engine which was very successful and remained on the market until the 1980s (or, according to one source 1979). Io ho una moto Graziella che sto ripristinando. Ho bisogno di fanale anteriore in vetro (quadrato). Ho bisogno comprare una Biella della moto Graziela 1974. I am looking to sell my motograziella I am trying to find out where the best place might be to sell it. I need spares of motograziella. I need the square light of this moto, could you help us ? Busco repuestos para esta motocicleta. Partes plásticas frontales, o´ticas , luces, etc. UN FANILIAR ME HA REGALADO UNA MOTO DEL MODELO ARRIBA INDICADO, PERO NO LOCALIZA LA DOCUMENTACIÃ“N DEBIDO A LA ANTIGÃ&frac14;EDAD DE ESTA.ASÃ? QUE ME PONGO EN CONTACTO CON USTEDES PARA CONSEGUIR LA FICHA REDUCIDA QUE ME FACILITA LA CONSECUCIÃ“N DE DOCUMENTACIÃ“N A TRAVÃ‰S DE LA ITV. GRACIAS POR SU ATENCIÃ“N. here is an excample of a chopped graziella, with italien engine at about 55 km/h and streetproof in germany. Hello I have a moped Vittoria Lambretta 48 but don't have any history on it, if you can help please send me an e-mail and I will send photos. I have been told that it was especially built by Lambretta for a race in Portugal and only a few were built, Portugal was the biggest market in Europe in 1950s because of there Colony's, Lambretta built these as to prove their reliability and where hoping that Portugal would put in some orders for the new Lambretta 48, if this is true I do not know but this is what I was told in Portugal. The page says in part, "In 1957, it mounts on the ciclomotori Vittoria also the motors of the Lambretta of 48 cc and produces a ciclomotore in sport version christened Solitude, with motor NSU." Ed. Je cherche des pneus de rechange pour ma moto ? Hi! i have a motograziella and I need some information in order to restore it. je dispose d'un réservoir de graziella pas cabossé que je mets en vente . prix à convenir. Translation: I have access to an undented fuel tand for a graziella that I wish to sell. price negotiable. Je viens d'acheter une graziella à remettre en état. Savez-vous où je peux trouver des pièces détachées. Il me faut un carburateur et les caches lateraux en plastique qui couvrent le moteur. Translation: Hello, I have just bought a graziella to restore. Do you know where I can find spare parts. I need a carburetor and the masks lateraux in plastic that cover the motor. Thank-you in advance for your response. Hi, another humble moped fan in search of a head lamp and cover with speedo for my 1972 Moto Graziella! Any ideas, anyone? Thanks, Nick d.
Here we are, the Moto Graziella Tipo Cheeky Boy. I kid you not! You can see what I mean about the head light - that reversing light is probably from the same era but it has to go! I found a photo of a Moto Graziella with the correct head light if this helps! It's a bit cluttered but the bike is in use as a clothes horse at the moment! It's for sale at around £400 if it appeals to anyone and is in superb condition. Just wish it was mine! p.s mine does not have peddles! Is this a later or earlier model? Please help!!!!!! I NEED INFORMATIONS ABOUT MOTO GRAZIELLA, BECAUSE Y HAVE ONE, AND Y NEED WERE TO GET A COMPLETE LIST OF PARTS (EXEMPLE, PALTIC'S PARTS). PLEASE SEND ANY VALID INFORMATION. Estou procurando informações para recuperar um scooter GRAZIELLA que acredito ser da década de 60 ou 70. My name is Antonio Albernaz of São Paulo, Brazil. I am looking information to restore GRAZIELLA motorcycle that I believe to be from 60's or 70's. Names of sites or manual copies would be much appreciated. non si producono piu´le moto graziella.possono trovarsi solo usate? Translation: they do not produce piu.le motion graziella.possono to find itself single used? I enjoyed your page and found out, that you might need some information. In 1967 the Italian brand CARNIELLI introduced a completely new folding 50ccm motorcycle named MOTOGRAZIELLA. They made use of the German SACHS 502 engine in at least 2 different versions, so they could offer a version with a top speed of 25 and another with 40 km/h. Surprising was the use of only 8 inch small tyres and the very short length of only 1,1 m. To build such a small vehicle, they used a quite unique way of steering. Three different colors are knows: Blue, green and red are the body colors (the plastic body parts are molded in these colors), the metal frame is always white. Soon after the MOTOGRAZIELLA was introduced, CARNIELLI offered another version, which had rear spring suspension. The production must have ceased in 1979, since SACHS discontinued the 502 engine. 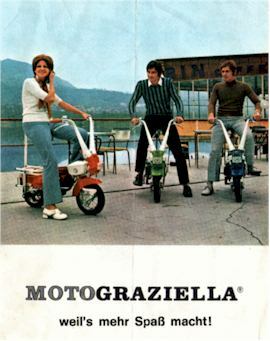 I try to add two scans taken from a German advertisement of the MOTOGRAZIELLA mopeds. They were imported from about 1968 to 1979 to Germany by GOLD-RAD (a German factory to bicycles; they used to build 50ccm mopeds in the 50´s I guess, too) of Cologne.